COVER REVEAL! Sort of...VOTE NOW for "Confection Connection"
Here's #3 - three times the charm? What do you think? Really? PLEASE post comments here; or email me directly: LizzLund.Author@gmail.com. Need your input gang! And...umm... soon please? Teresa and I are aiming for a Thanksgiving release! Gardening Trick, that's a real Treat! My chef husband and I love to cook. So, naturally, we love fresh produce. Our 2013 experiment, an asparagus bed, will be with us for years to come. Our new challenge: globe artichokes - I’m determined. But artichokes are large plants, and need room. Specifically, their own bed. That said, the hardest part of starting a garden, is starting a garden. Forming a garden bed out of your lawn used to mean hours of back breaking work digging up sod. Notice, I said, “used to.” Because now, instead of digging up sod, you’ll set up a lasagna bed, and let it “cook” over the winter. No, you won’t be harvesting casseroles - although you might the stuff that goes into them. Just let this churn from November until May, and you’ll have a fantastic bed full of rich top soil, and best of all, worms. Ingredients: lots of newspaper, cardboard boxes (the kind without the laminate on the outsides), some topsoil, and mulch. Measure the area for your new garden to determine how much newspaper and cardboard you’ll need. You’ll be putting down a few layers. Mark off the area for your new garden with some twine and garden stakes - this way you’ll have a nice, precise edge. Using your garden hose, soak the lawn area where the new bed will be. Then, lay down a layer of newspapers, wetting them as you go so they don’t blow away. Top the newspaper with a layer of topsoil, about 1-2 inches. Put down another layer of newspaper, wet and top again with topsoil. Then, put down a layer of cardboard. Thoroughly wet the cardboard. Add more topsoil, and another layer of cardboard. Wet again. Top with a layer of mulch, about 3 inches. Wet it all down again. Keep watering the bed every other day or so, until you have to shut off your hose. Then, sit back and wait until Spring while the worms do all the work! 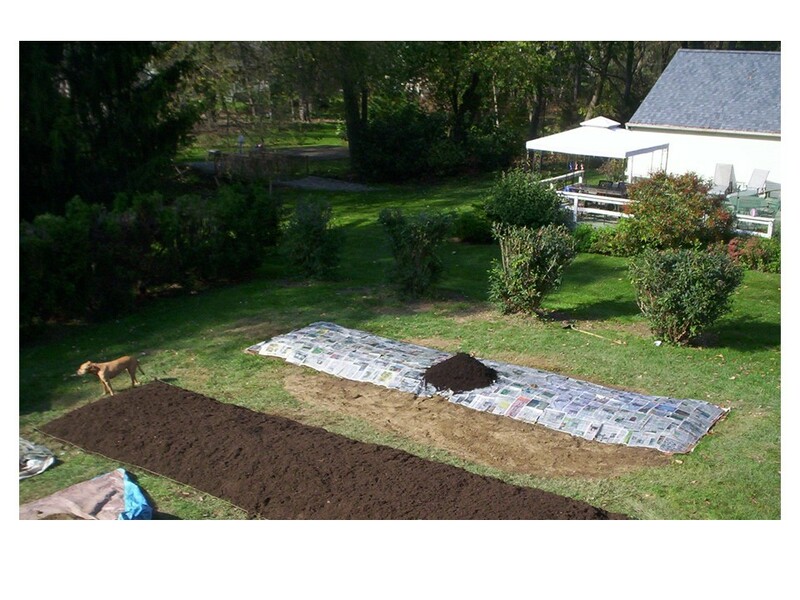 The layers will kill the grass, turning it into nutritious topsoil, and you’ll be able to plant easily. I write fiction. That is to say, I take the truth, dust it off a little and top it off with a lie. On (virtual) paper. I write humorous fiction. This means I spy the world from a lop-sided angle and share my fun-house views, in the hopes of giving you LOL’s. Specifically, I write women's humorous mystery fiction. With a culinary bent. And recipes. And an over-sized tabby cat. And wine. Lots of wine. So my stuff is a bit of a hybrid. Which makes reading about famous authors’ writing habits scare the crap out of me. I’m half-way through the first draft of my 4th novel, since I began in aught twelve, and considered four novels in two years pretty darn good. Until I read about writers who begin their day at five o’clock (yes, that’s a.m.) and fall into a frazzled heap somewhere around eight at night. Without eating. And no water. And definitely no wine. Then, there’s the night shift: authors who pound on the keyboard while the rest of us produce zzz’s, with the exception of the vampires, ghosts and goblins that they write about, who are presumably dictating a mile a minute. To be fair, I imagine it would be far more time consuming listening to a vampire - there has to be some type of speech impediment associated with fangs. So these writers understandably have to put in some heavy hours, considering their research subjects. By both accounts, I am woefully behind and should be working on Mystery #82, with several thousand recipes at the back. Thanks to our new computer, I've also have ADD. 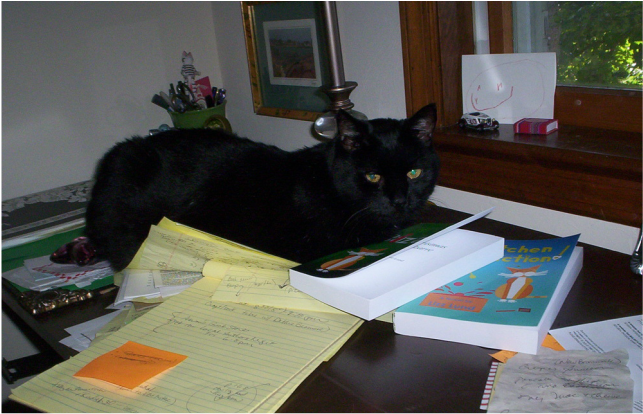 When I first began writing with the old laptop, my greatest distraction was the cat, since it couldn't connect to the internet. The laptop, not the cat. Now, with the new and improved All-In-One, I’m whizzing and whirring farther and farther away from my manuscript quicker than a Twitter Trend - #IsThatAChicken? Of course, we all have our own daily habits. That is, you probably do. At this point, I’m convinced the only way I’ll get a habit is to join a convent. But I digress. Again. Hey, I’m good at it. Who peed on my mouse? TGIF! The following FUNNY is from the pen and addled mind of myself, and my alter ego, known to family and friends as Lucretia Manic. Hope you have some Friday fun with this. 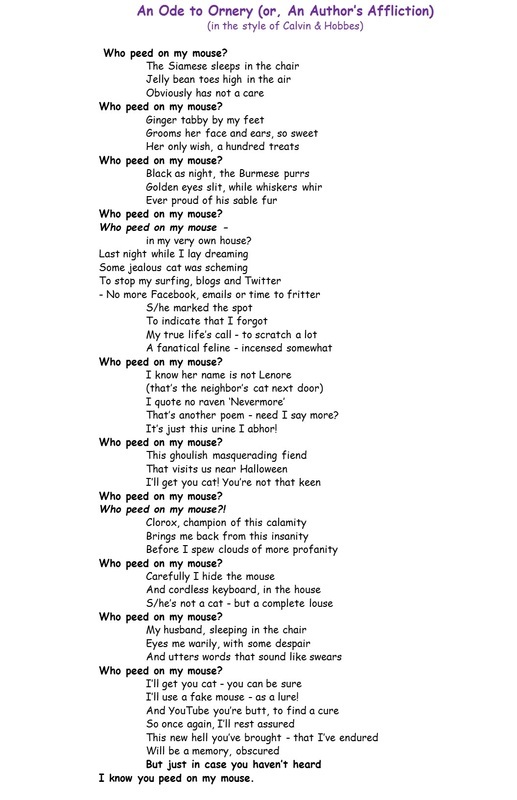 ALSO - now there's a GRAPHIC CONTEST about this poem! Yep, you heard that right (write?) 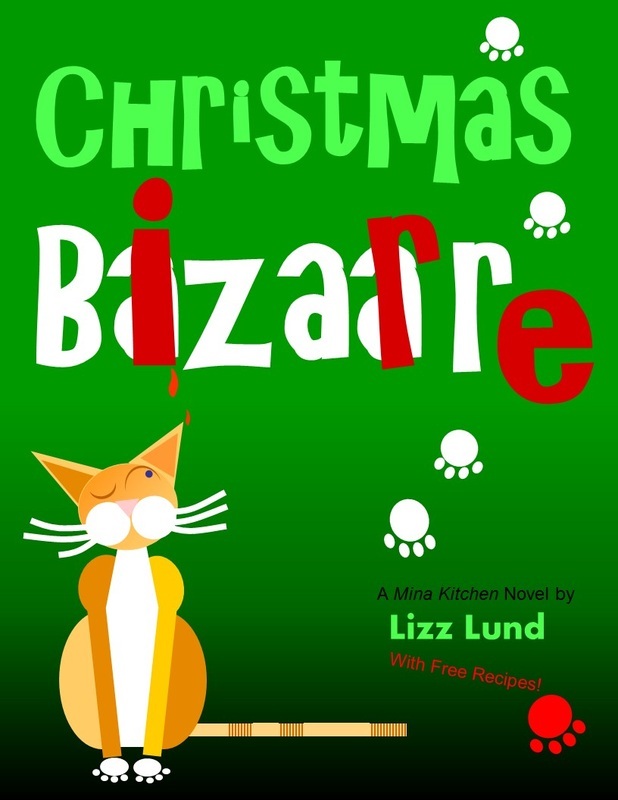 The winner gets a FREE signed copy of Christmas Bizarre, or Kitchen Addiction! Winners will be picked on November 28th - Black Friday - hurry! Yeah, I Can Ruin That. “So, how do you come up with the ideas for Vito’s recipes?” the kid sister asked me nonchalantly over the phone this morning. ‘Kid’ being a deceptive moniker - yeah, she’s my younger sister. And she’s racked up almost as many writing hours as a band of rogue New York Times journalists chugging Red Bull shooters. She doesn’t write fiction, so she’s not charged with compelling readers to try her wares. She writes to invigorate membership for an association, which means the more the merrier for them - and her. She’s been there several years now - so yeah, she’s good at that. She’s also a very good single-ish mom (insert 16 hour days preceded by snarky divorce here). And a great neighbor (the local ice cream truck gleefully spots a sucker as he rounds the bend), member of her church (and at one time, vestry - when the heck did she do that? In her sleep?) Plus being a loyal friend (yes, she makes time for those) and, well, my sister. And my friend, too. And so I was a little taken aback by her question. I mean, who cares? Some more thudding repeated itself. A large slice of kielbasa stared back at me swimming in an ocean of sauerkraut, along with something green. We hung up. Then my faux Vinnie pounded his paws on the counter, all but pointing where the cream is kept. Sucker that I am, I indulged him, and went back to work. I soon found him sitting on the desk next to me, swatting my computer screen with his tail. He swatted at this blog post some more. A lot more. He hunkered down and frowned at me. I commenced searching for something appropriate, as my mini-Mountain-lion leapt down to lap up his cream: mission accomplished. So, without further ado, below is a good recipe as form of an apology for the aforementioned queasy reading. It’s also included in the “epilogue” recipe section from Mina Kitchen Mystery #2, Christmas Bizarre. This is a simpler, more working-person-friendly version of Choucroute Garnie. As Julia would have said, bon appetite! I was horrified to discover that Vito’s various means of killing kielbasa are based (loosely) on fact, according to my better half, the Chef. Apparently, there are as many versions of Choucroute Garnie as there are Vito’s best intentions not to destroy it. Oy vey. The version below is my take on this game; which personally I find well suited as comfort food in the winter. Rinse and drain the sauerkraut well, and spread across the bottom of a large roasting pan (I use glass/Pyrex). Sprinkle the chopped apple and caraway seeds on top. Cook the bacon in a skillet. Remove the cooked bacon and set aside. Add the chopped onion to the bacon grease (you may want to add a little butter.) Cook until translucent. Combine with the sauerkraut/apple mixture in the roasting pan. Melt the butter in the skillet and combine with vegetable oil. Cook the pork chops to brown on each side; until about half-way cooked through. Add the pork chops to the center of the roasting pan, resting on top of the sauerkraut mixture. Crumble the bacon and sprinkle on top of the pork chops. Prick the skins of the Knockwurst, then add to the roasting pan, to surround the pork chops. Add the carrots to the outside of the Knockwurst, to outline the meats with a carrot ‘ring’. Cut the kielbasa into 2-inch sections and add to the edges of the pan, alternating with the red potatoes. Place the roasting pan on an oven rack, and add about 1 cup of the white wine. Bake until all meats are cooked, approximately 1 hour; times will vary. Also, you will want to look in on it every 20 minutes or so, to adjust adding more wine or not. To serve: remove from oven and let ‘set’ for about 10-15 minutes. Serve with a slotted spoon, making sure a taste of each meat is included in each portion. Suggested sides: green salad topped with sliced apple and a light champagne vinaigrette; French/Italian bread. And he has. Vito Spaghetti’s been a figment of my imagination, and Mina’s neighbor, for a few years now – and many years to come. I have a fond place in my heart for Vito. Okay, so maybe it’s a fond place for his Swiffer addiction. But I get a moment to giggle every time Vito helps me – and Mina – “improve” a recipe. “Hey, I was wondering who was intruding on you this early in the morning.” Vito helped himself to the creamer in my fridge, and poured himself some more coffee. I shuddered inwardly and grimaced at the vision of my icon spinning in her grave. “Yeah, that is too bad. What are you making?” I had to ask, yes? I mean, someone has to tell the paramedics, right? “Gee, I'm sorry I'll be working and have to miss it.” Thank-you-baby-Jesus. I could also look forward to a large bottle of Tums and some solitude – neither of which I had. “Oh. Wow.” Frostbite was sounding better and better. “Yeah! We got just three weeks to practice! See?” Miriam waved the contest literature in front of me. “Do you have an entry dish?” I know, I know. But someone has to ask, right? “What are you making?” Look, you want me to ask. Besides, you don’t risk digestive surprises where Vito and Miriam are concerned. I considered a hasty Plan B involving a bald faced lie about visiting the preggo sister in Northern VA. Or having shingles. Something. I swallowed hard. “It’s very in now,” I fibbed. But I really like the idea of tuna fish brownies with mayo shooters. Well, okay, maybe Vito likes them a tad, too. 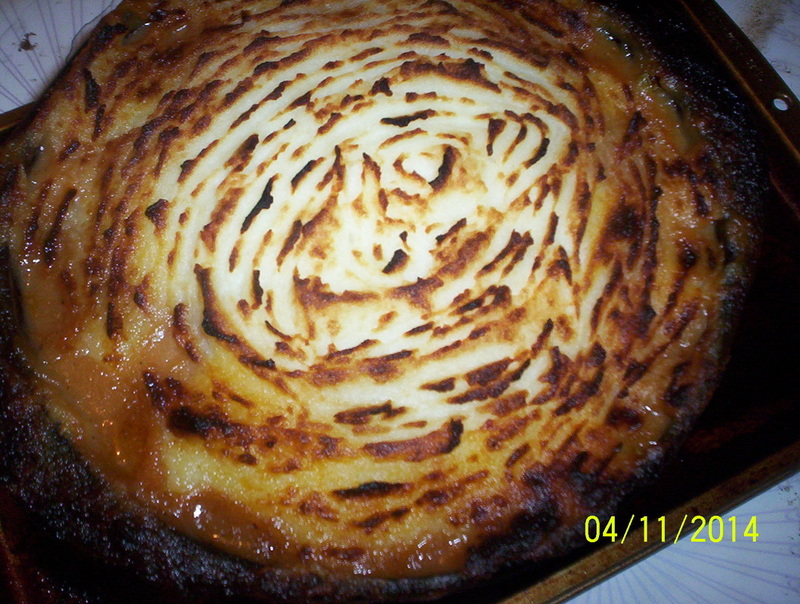 I have a feeling you all will be reading about them – or something very similar – in the next novel, "Confection Connection" or the 4th, “Perfectly Pickled.” Of course Mina will offer up something edible… maybe a nice variation on Shepard’s Pie, like the one I made for Chef Hubby (see below). Until then, please help yourself to a full serving of “Christmas Bizarre” – you’ll be more than glad you did. I just finished chopping my tenth bag of onions, when another truck appeared. “Pull it up, over here!” someone yelled. The beep-beep of a truck in reverse blared all around us. But its tailgate was too high. Several hammers pounding on it forced it into lowering to the ground. Which was a good thing - there was no way we were going to get the baby grand piano back inside, at a lifting height of over three feet. Suddenly, hundreds of green peppers rolled all around us. They got scooped into laundry baskets and thrust onto all the kitchen counters. “Keep chopping!” voices yelled at me. I did as I was told. But then fretted a bit, after I saw another truck pulling up with the eggplants. They got dumped out in a cascade of purple waves. The garage floor was awash in dark purple orbs. And, I had no idea of what I was going to wear to the ball. I got so mad. I kept cutting and cutting at the peppers, but nothing worked. Soon, the eggplants were tumbling in around my feet, washing in from the garage. I woke up the next morning and poured myself a cup of coffee. There was a decimated green pepper sitting next to the coffee pot, along with a dirty spoon. Oh. He had a point. Although the spoon, obviously, did not. “That’s great! How about I make us some stuffed peppers?” Well, that would be 2 down; 22 more to go. My. And just after I dusted off Edgar Eggplant from the floor, and was about to give him his bath. I can’t take too much creative credit for this blog post. Once again, here’s a story that falls under the category of “Stuff You Can’t Make Up.” But I thought it’d make you chuckle – so, here ye be. Husband and I wander around the outside of our house last night, realizing we need to paint the exterior. Soon. “I’ll just get up on a ladder and do it,” Himself says. “No, you have never painted the outside of a house before. We had siding before. And I saw what you did to the inside of your old apartment.” Translation: husband had yet to learn the necessities of prepping before you paint, which means using blue painter’s tape. The living room ceiling had huge splotches of dark gold “oopsies.” And, was never patched in. It gave a nice, abstract, giraffe-spot effect for a few years. “When? You’re booked at work in the Fall; and Spring starts Mother’s Day, graduation and wedding season.” Himself is a chef. One of the few months he gets extra time on his hands is February. Exterior painting with ice cycles doesn’t seem like a lot of fun to me. Nor does visiting him in hospital for Valentines Day. The next morning I open up our local Advertiser paper (NJ’s version of The Shopper). I recognize the name of a painter I’ve been seeing advertise here for the past 15 years. Certainly not a fly-by-night guy, so I call him up. The answering machine starts. I wait to leave a message. This repeats. I suddenly recognize Donna Summer’s “Bad Girl” lyrics. The rest of the message continues. I leave my message and hang up, feeling oddly comforted that the Lord clearly was with me in all those disco bars in Teaneck and Paramus, way back in the day. That, and we’ll probably be hiring a painter who listens to some oldies but goodies while he works. I wonder if he wears gold chains? Naa-NAAH - Naa-naah - Naa-NAAH – Naa-naah – BATMAN! It’s been the month from H-E-double-toothpicks. Being married to a chef ain’t easy (google “chef widow” here). And since we are in Lancaster, Pee-Ay, there is apparently an abundance of farmer’s wanting breakfast parties – starting no later than 5:00 a.m. WTH? Is there a farmer/vampire hybrid exclusive to Lancaster? However, husband’s boss is delighted with this, as is our car payments, so… we owe, we owe, etc. It’s not always this crazy. It’s just that this month has been intense. And with all my better-half’s attempts at being quiet at o’dark hundred, it doesn’t really work. Talking to his toothbrush or punching the alarm clock gives my perception of this a nice, consistent feel. So I’ve learned to wake up at 4:00, 3:30, whatever, then sort of go back to sleep (pending alternative cat issues) and re-enter the land of zombies later that morning. However, sleeping three hours at a time hasn’t really cut it. And, as we’ve both found out the hard way, tired doesn’t work for us. It really doesn’t. Luckily, pasta does and Chef husband’s an easy guy about that. He’s a pasta-saurus. So I continue to read my Kindle, eventually behind closed eyes. I soon turn out the light. It’s about 11:00 p.m. I awake to see four of our cats leaping off our bed, in mid-air, in conjunction with my husband - who is standing in the middle of the room, wielding a towel like a Ninja sword. Ninja staff. Ninja something. I google it quickly on the iPad – back to Ninja towel. Hmmm. Husband is thankfully not into weird stuff. So, this is a tad alarming. I, of course, don’t put the covers over my head and finally look around the room – leaping cats and all. It’s making for an interesting circus. Dark wings are now frantically flapping over my head, while a cat (or two) leaps and it dodges toward my husband’s Ninja towel. “A bat?” Hope springs eternal he’ll say it’s a drone. Or, one of his aliens. I do so dutifully and immediately. This is the first (and last time, thus far) I have ever responded as requested by my husband without putting up a fight. No argument here. Just get rid of the freakin’ bat. The sound of four cats hissing. Not to be desired. The sound of the front door opening and slamming at four o’clock. Well, at least it wasn’t because of a quarrel. “So?” I ask – full alert, and upright, having risen above the cover compound. An hour later, the real alarm rings – for Chef. He performs the usual ritual of slapping the alarm clock about and screaming at the toothbrush. Along with slamming of closet doors, coffee mug cabinet, and door to the garage. Thirty-minutes later, I drift to sleep. Move over zombies. Another author starts her day.